What is the Pedigree of NY 2? 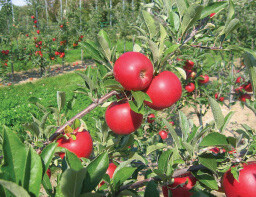 The new variety was derived from crossing the apple variety ‘Braeburn’ with the apple variety ‘Autumn Crisp’ in 1992. ‘Braeburn’ is a hybrid of ‘Lady Hamilton’ by an unknown pollen parent. ‘Autumn Crisp’ is a hybrid of ’Golden Delicious’ x ‘Monroe’ and ‘Monroe’ is a hybrid of ‘Jonathan’ x ‘Rome Beauty’. What makes NY 2 special? This hybrid is very grower friendly, with a vigorous tree, long harvest window, and great red fruit coloration. Consumers appreciate its crisp, juicy snap and its balance of sweetness and tartness. NY 2 has good resistance to flesh browning after cutting, suggesting it will be a good for fresh-cut slices. NY 2 is a good dual use variety, great for eating out of hand, but also great for pies, sauce and fresh fruit salads. How long did it take to develop this variety? The cross was made in 1992, so it was about 18 years from crossing to commercialization. What is the size of the family from which NY 2 was chosen? NY 2 was selected from a population of 1,017 seedlings, a relatively large cross. Are there other siblings that have commercial potential? Yes, several sister seedlings are still being evaluated for potential commercialization. Will this variety be used in RosBREED and how? NY 2 was phenotyped and genotyped, along with some of its sister seedlings, ancestors and one offspring. NY 2 was from a cross that was made to study the genetics of flesh browning after cutting and also vitamin C content. The pollen parent, ‘AutumnCrisp’ from Cornell, is known to be low in flesh browning and to have a good amount of vitamin C. Many offspring from this cross were good as or better than their parents for resistance to flesh browning and many were intermediate for vitamin C content (which is higher than many commercial cultivars).